9. Ann "Annie" Speedy. Daughter of Thomas Speedy & Isabella Patterson. Born 12 Sep 1844 in Harvey. Christen 27 Oct 1844 in Harvey By Rev. Daniel McCurdy . Died 29 May 1876. Annie, age 26, and Charles, age 4, are listed in the 1871 Census with her parents Thomas and Isabella Speedy, however they are not listed in the 1881 Census. No further record. 2885. 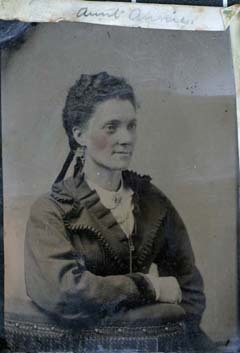 Undated tintype image of "Aunt Annie". Ann "Annie" Speedy (1844-1876). Source: Darrell Messer, Harvey, Rephotographed by Tim Patterson. 26 Jul 2007.